No matter what size startup you’re running or working for now, this type of scenario is right around the corner: You want to set up a booth at a trade show with a prototype of your product. You’ve put it all together when you receive a ping from your finance person: “You’ve exceeded your allotted marketing budget for the quarter.” Next, you hear from legal: “Are you planning to have everyone who interacts with the demo sign an NDA?” Before you know it, every move you want to make feels like this — bogged down. Founder and bestselling author Eric Ries calls functions like Legal, Finance, IT, and HR “gatekeepers,” and he’s well acquainted with them. Between writing The Lean Startup (investigating how startups can stay speedy and agile), and his new book The Startup Way (looking at how big corporations can become more nimble), he’s seen first-hand how these functions can either slow startups down or give them more winning momentum. In this exclusive interview, Ries explains how startups can avoid falling into the traps of growth that kill too many companies each year. He describes how to create and work with gatekeepers differently so that you can keep scaling innovation as you scale your company. Most early teams neglect gatekeeper functions until it’s too late. Legal, finance, IT — these teams are created reactively and treated as enforcers, not enablers. To root the strategy in reality, Ries guided the conversation to minimum viable products (MVPs) — the lowest-lift thing you can try to get important learnings. “One idea was — and this was when Facebook ads had just come out — running some Facebook ads in the target countries, where the company would recruit people to pre-order the product. The idea being that we’d get 100 people in each country exposed to the ad, and see what percentage of them give us their credit card,” says Ries. “The company would offer them the English version of the product for free, and then the local language one would ship as soon as possible after." Multiply this cautionary tale by each product launch, market entered and customer segment targeted, and the impact on a business can be monumental. So what can startups do to get ahead of these default assumptions about gatekeeper functions? Ries has a list of tips for three key stakeholders: people not on gatekeeping teams, those who are gatekeepers, and the leadership team at your startup. Scan to your section to read the his top tip and action for you to take today to set up your gatekeeper functions for success as you scale. Rule: Avoid the eleventh-hour ask to prevent a gatekeeper’s lose-lose scenario. “How often have you pinged Legal or HR the afternoon you need an answer because you didn’t plan for their sign-off? If that resonates, it should be no wonder that you’ve only experienced — and reinforced the belief — that gatekeepers are always blocking you,” says Ries. “What they experience is someone calling them with no lead time, pitching a complex plan and asking for a thumbs up or down by end-of-day. From the lawyer's point of view, that's a lose-lose proposition. Either she has to say yes to something that has more liability than she's comfortable with, or she has to say no and be the evil one. It’s not long before non-gatekeeping functions like Product or Marketing are saying, ‘Those jerks in compliance hate us. They never let us do anything.’"
Tactic: Employ a cross-functional team from the start. Of course, the benefits of a cross-functional team — especially between engineering, product and design — are well known. But how often might you think to include counsel or compliance at strategic points in plan development (not just at the start and finish, when contributions are limited)? To illustrate this point, Ries shares an anecdote. Now that their compliance colleague was officially part of the team, Ries told Product to bring him to the next workshop. “When we started, the guy from compliance — we’ll call him Kevin — had his arms crossed and locked a death stare on me. The original product team is still mad. But we proceed with MVPs and lean startup 101 principles. One PM spoke up. ‘Hey, I have an idea. We could pre-sell our products to hospitals ahead of time. We could get like three pilot customers and do a trial to learn whether we have the right commercial model way sooner.’ An engineer shot it down, saying ‘That's not going to work because everyone knows that you're not allowed to pre-sell a medical device without FDA approval.’"
Ries watched the product team’s collective jaw drop to the floor, and then rattled off a series of questions about other exceptions. Kevin jumped into a dozen of them. “He was empowered — and it was so impressive. The team made much faster progress after that. The FDA thought they were amazing, instead of being super weak,” says Ries. Rule: Revere how others build, be flexible in how you build. Ries has studied different types of gatekeepers, and he’s seen commonalities among those on track to become effective. The attributes aren’t all that dissimilar from high-quality startup employees generally, but are particularly critical for gatekeepers. Gatekeepers must be agile thinkers. Ask them for a best practice in their line of work. Then ask where that same best practice would be inappropriate. Agile thinkers know a best practice isn’t always best. Tactic: Create a one-pager for your customers. Ries advises gatekeepers to create a one-pager for their internal stakeholders, who are essentially their users. A lot of what gatekeepers do is very complex and requires rarefied knowledge, but they can simply explain and lay out the easiest ways to work with them so they can do their jobs even better and faster. To keep things simple, they should limit this guide to a page, so that stakeholders know exactly when they can handle things on their own, when they need to interact, and what information they need to provide. The trap here is that it’s very hard for gatekeeping functions to make one-pagers. “The GC thought it was a great idea and sent his team to make the one-pager. Guess how long the document was when I first saw it? 10 pages long. It was a 10-page "one page" document because they're lawyers; that is their ‘one-pager,’” says Ries. “There was fine print and all these legal definitions and ‘your mileage may vary disclaimers.’ That won’t fly. Gatekeepers have to consider their customers. It has to be consumable and comprehensible to product managers and engineers. They're not going to read some legal document, no matter how beautiful you think your policy statement is." Rule: Foster an environment where gatekeepers can serve, not just respond. With gatekeepers, there’s no progression without representation. Tactic: Keep gatekeeper functional heads accountable according to the cycle time of teams. Ries invokes SLAs — service level agreements — to establish clear ground rules. “Just like you have an SLA agreement with AWS, what's the service level agreement between legal and the rest of the company? When we send you something, what kind of turnaround do I get? What is the cadence of releases and getting feedback from customers? If we don't measure that, none of this other stuff is going to matter,” says Ries. “But assuming we're measuring that, then we can track the legal contribution to that cycle. The CEO can say to all the gatekeeper VPs, ‘You are a committee together, and your job is to oversee this response time and drive it down. So I want to see teams that are very productive. Each of you needs to take a productivity metric, create a dashboard and own it. Let’s review monthly." 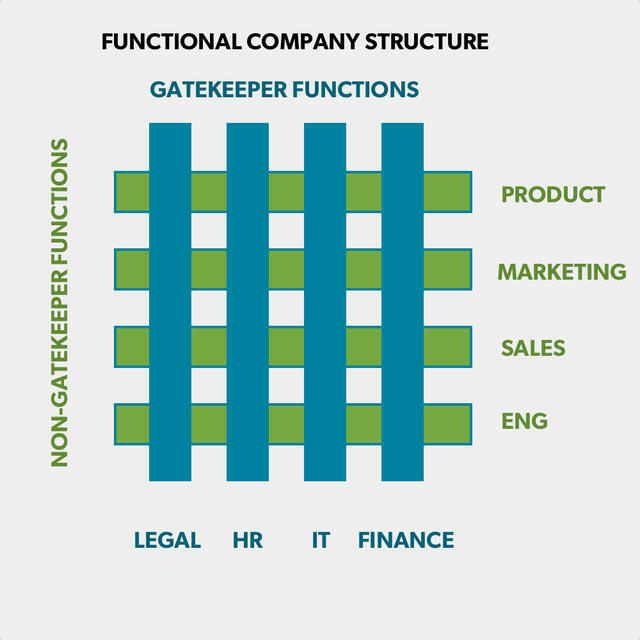 To many startups building quickly, “gatekeepers” is a pejorative term. Instead of being equal functions that can protect and reveal your team’s blind spots, they’re seen as a bottleneck. In his career and research for The Startup Way, Ries has seen too many startups and big companies alike work with gatekeepers reactively rather than define how to operate with them proactively. The result is a stigma around gatekeepers and growing tensions within teams. Instead, tell your non-gatekeeper functions (Product, Engineering, Marketing, etc.) to build a cross-functional team from the start (formally make gatekeepers a part of your team if you can). This will cut down on those relationship-damaging last-minute asks. Gatekeepers should draft layman’s one-page cheat sheets for teams, so they can set expectations without complicated legalese or industry-speak. And lastly, for CEOs or founders, give precise metrics — try rewarding gatekeepers that create faster cycle time for teams, versus protecting against all liabilities. Image courtesy of Travis P Ball/Getty Images Entertainment.